Any chance to turn a simple get together into something fun & creative, I'm a huge fan of. As the Super Bowl approaches, I know that even guys appreciate a nice set up and some thought put into a superbowl party. 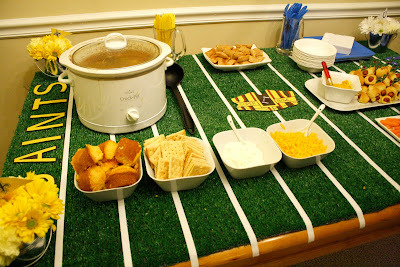 I've never held a Super Bowl party and this year I think we are going out to a local bar with friends but I can't help but love all the football inspired party ideas I'm seeing lately. If you are throwing a shindig tomorrow, here are a few ideas to jazz up your party without a lot of fuss. Enjoy! 1. Create football decor in a snap. A lot of grocery stores have cheap paper table clothes with football themes or you can go the extra mile and create your own. You can buy some green felt and iron on the 10, 20, 30 lines or you can buy a foot of AstroTurf and put down white tape for the lines. 2. For those who plan in advance, football invites are a fun way to get people excited for your party! You can either order invites online or set up an Evite with a football themed background. 3. If you have kids to entertain, set up a table just for them. Set aside a room in the house with a tv, games, so they can run around and not interrupt the big game. Make sure there are kid friend food and lots of napkins! 4. Superbowl is about 3 things; the big game, the commercials, and THE FOOD. Keep guests happy with a balance of 'real food' like chili, pulled pork (both great crockpot dishes to make your prep easier), 'finger food' like chips, dips, veggies and some sweet desserts. This is a key way to get creative and as long as it is delicious & looks football related, your party guests will be happy. 4. Make sure to incorporate the team spirit of the Super Bowl. This is last year's lineup and I think this party had it completely right. 5. Last but not least, get creative with your decor! There are plenty of expensive decor items that you can buy for your party & if you plan on having a party every year, it might be worth it. But for most people, you can search around grocery stores and toy stores even to find little details that will add a big impact to your party decor. Framed pictures of your man in his high school football uniform or even your favorite players, little football figurines, pom poms, football themed coozies, anything that will add interest without costing you a fortune. Get creative & enjoy the great American pastime!